1918: Vaccine (typhoid, paratyphoid, yellow fever, smallpox, two trial flu vaccines, etc) manufacturers used pigs and chickens to "culture" vaccine ingredients. The resulting vaccine mixtures accidentally create a "reassortant strain" of pig, bird and human DNA. may have contributed to a somewhat greater than usual influenza rate. However, basically there was NO Spanish Flu Pandemic. What did exist was a "vaccine pandemic" and an "aspirin pandemic." Fear and greed caused vaccines to be hyped for protection against various diseases which returning military were supposed to be carrying en mass. The recent discovery of aspirin's ability to "kill fever" was used by lay people and doctors alike to treat influenza. The result of suppressing fever, a healing mechanism of the body, was that influenza turned into pneumonia. Main stream doctors lost high rates of both influenza and pneumonia patients. While non-drug doctors had very low rates of patient loss. 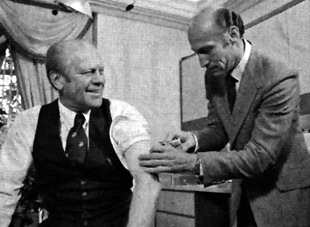 1976 A vaccine against a "Swine Flu" was more harmful than the "Swine Flu" which never materialized. 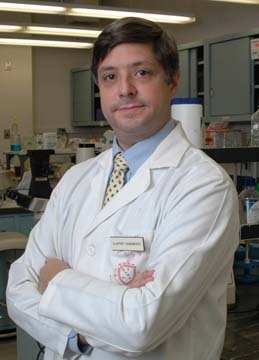 1997-2005 In 2005, Dr. Jeffrey Taubenberger at the Army's Ft. Detrick completes the recreation of the 1918 "Spanish Flu Virus". The virus turns out to be as above descibed, a mixture of swine, bird and human DNA. 2005 After the recreation of the 1918 "Spanish Flu Virus" at Ft Detrick, Taubenberger takes a more lucrative position with the National Institute of Health (NIH) for the purpose of creating a vaccine against the "Spanish Flu Virus" that he and his team had just recreated. 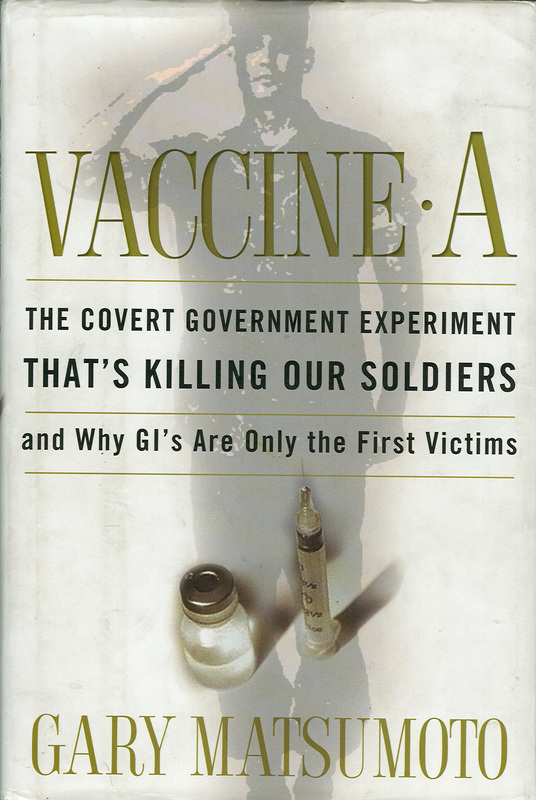 2007 "In 2007, as part of preparedness for an influenza pandemic, WHO worked together with health officials, regulatory authorities, and vaccine manufacturers to explore a broad range of issues surrounding the regulatory approval of pandemic vaccines." How One Wicked Nation Can Kill Billions Around the World - - With One Lie! by Lorraine Day, M.D. More Doctor's against the swine flu shot An interview with Dr. Russell Blaylock. Flu Vaccine Exposed Dr. Mercola posts a YouTube video created by Thinktwice Global Vaccine Institute. See Flyers/Editorials, some of which contain doctors information and advice. Results The overall willingness to accept pre-pandemic H5N1 vaccine was only 28.4% in the first survey, conducted at WHO influenza pandemic alert phase 3. No significant changes in the level of willingness to accept pre-pandemic H5N1 vaccine were observed despite the escalation to alert phase 5. The willingness to accept pre-pandemic H1N1 vaccine was 47.9% among healthcare workers when the WHO alert level was at phase 5. The most common reasons for an intention to accept were "wish to be protected" and "following health authority’s advice." The major barriers identified were fear of side effects and doubts about efficacy. More than half of the respondents thought nurses should be the first priority group to receive the vaccines. The strongest positive associating factors were history of seasonal influenza vaccination and perceived risk of contracting the infection. Up to a third of [British] nurses will say no to the swine flu jab [vaccine] because of concerns over its safety, a poll has found. NHS [health care] workers are first in line for the vaccine, but a survey of 1,500 nurses found many will reject it. In the event of an influenza pandemic, the majority of people infected will be nursed at home. It is therefore important to determine simple methods for limiting the spread of the virus within the home. The purpose of this work was to test a representative range of common household cleaning agents for their effectiveness at killing or reducing the viability of influenza A virus. ... are inactivated by extremely low concentrations of chlorine (0.52–1.08 mg/L, . Our data suggest that 1% household bleach, which equates to 0.05% sodium hypochlorite, are sufficient for the inactivation of human influenza viruses. An article in Minneapolis Star Tribune reports on how some pregnant women are skeptical of the new H1N1 vaccine. Pregnant women are among the groups strongly advised to get the vaccine, but many women are less than thrilled about the idea of getting the shot, reporting concerns about the safety of the vaccine and possible effects for the unborn baby. Dr. Michael Bronze of the University of Oklahoma Health Sciences Center, stated on WebMD that the actual risk of pregnant women getting hospitalized for swine flu infections is one in 300 thousand. The Australian/New Zealand's flu season was surveyed by American epidemiological statisticians. The data from around the middle of that flu season indicated that pregnant women are 99.97 percent sure of avoiding hospital care for any flu. Of those few admitted and held in ICU 7.7 percent died. Not a high figure. And even those few had other health complications prior to being infected with the swine flu. Vaccinations Are The Real Danger. According to Dr. Russel Blaylock, retired neurosurgeon and author of Excitotoxins: The Taste That Kills, various studies have proven that artificially stimulating the immune system causes a cytokine immune reaction that damages the forming brain of a fetus. Paramedics were called to Sacred Hearts Academy today after about a dozen people appeared to have a reaction to the H1N1 swine flu vaccine. Officials say the apparent reactions could have a lot to do with anxiety rather than the vaccine itself. Approximately 300 students and 100 faculty at Sacred Hearts Academy got armed against the H1N1 swine flu Monday morning in the State's school vaccination clinic. Kindergartener Tai Martinez was one of those students. "Under the recommendations of her pediatrician we felt confident," said Tai's mother Jade Martinez. But school officials say about a dozen people had an apparent reaction minutes after getting vaccinated. "It ranged from a rash on the arm, to breathing problems, their neck tightened up. A couple became nauseous. The most common complaint was light headedness," said Betty White, Head of Sacred Hearts Academy. The clinic manager called EMS four times, and altogether paramedics took five students and one adult to the hospital. All were released by noon, except for one student who has asthma. Feel free to download, copy and distribute everywhere. "INJUNCTIVE RELIEF AND DAMAGES FOR INTENT TO CAUSE BODILY HARM"
A reminder that crimes against humanity by Nazi doctors were punished at the end of WWII, and may be punished again if doctors participate in a mandatory "Pandemic Flu" campaign. Scroll to the bottom of the page and copy the text there for a letter to your local doctors, nurses and public health workers. "A Hard Look At Mandatory Live Vaccinations and ACTION STEPS". This letter delivers urgent notice that dozens of health experts, religious leaders, and world leading scientists are condemning governments worldwide for going along with pharmaceutical industry-influenced plans to inject people with poorly-tested toxic vaccines this flu season based on fears of pandemic swine flu. Citizens For Legitimate Government is a multi-partisan activist group established to expose and resist US imperialism, corpora-terrorism, and the New World Order. Is swine flu really a news worthy item? Links to articles and a 10 minute YouTube presentation on the swine flu scam. Leonard Horowitz will be doing a 20 minute radio show very Thursday on FM 91.5 from Lowell/U.ofMass. at 10AM EST on Pandemic Flu related topics with David Tierney, and will simulcast via FLUscam.TV online video and audio. Dr. Stefan Lanka Exposes The "Viral Fraud"
Flu Index Page Much general info about influenza and influenza vaccine. This article argues for mandatory air pollution review during flu diagnoses. It also argues that public perception of air pollution is minimized for reasons of industrial economics and politics, by way of laws, rules, education, mainstream news and paradigm promotions imbedded in entertainment. Flu is nearly always considered viral, as evidenced by a search of the CDC website, The New York Times, or any media. Medical campaigns vaccinate millions worldwide, purporting to protect against flu epidemics, yet the symptoms of viral flu are the same as toxicological flu, and flu epidemiology makes toxicological sense. "…a landscape that was contaminated with respiratory irritants such as chlorine and phosgene, and characterized by stress and overcrowding, the partial starvation in civilians, and ..."
Background The 2009 pandemic influenza A (H1N1) virus has emerged to cause the first pandemic of the 21st century. Development of effective vaccines is a public health priority. 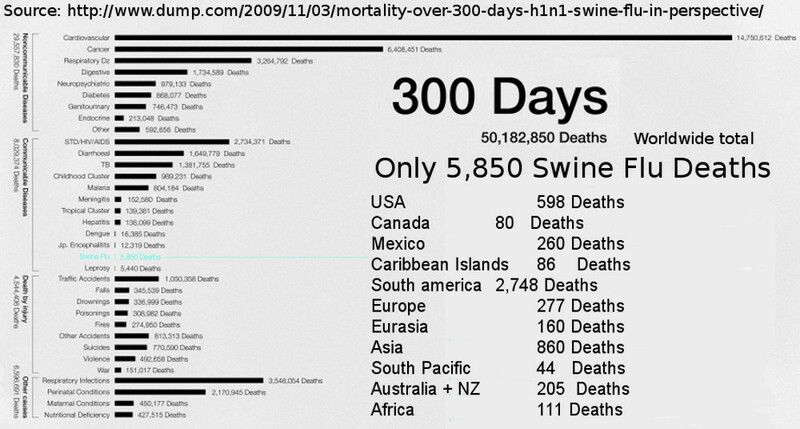 Swine Flu Expose by Eleanora I. McBean, Ph.D., N.D. Sometimes one person is right and everybody else is wrong. Anthrax and Swine Flu info. PANDEMIC FLU SHOTS - WHAT CAN I DO? 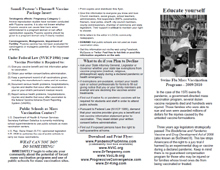 This document addresses the boundaries of your right to refuse H1N1 (pandemic swine flu) shots in the United States, should they be mandated in the near future in the context of a declared emergency pandemic. The Public Readiness and Emergency Preparedness Act (“PREP Act”) enacted as Division C of the Defense Appropriations Act for fiscal year 2006, Pub. L. No. 109-148, added new authorities under the Public Health Service (PHS) Act to alleviate concerns about liability related to the manufacture, testing, development, distribution, administration and use of countermeasures against chemical, biological, radiological and nuclear agents of terrorism, epidemics, and pandemics.1 Questions have arisen from the manufacturing industry and the healthcare community regarding the scope of protections available under the PREP Act. WHO admits vaccine manufacturers have used "mock-up" vaccines to mimic the novelty of a pandemic virus. Also in Europe, some manufacturers have conducted advance studies using a so-called “mock-up” vaccine. Mock-up vaccines contain an active ingredient for an influenza virus that has not circulated recently in human populations and thus mimics the novelty of a pandemic virus. Such advance studies can greatly expedite regulatory approval. Jane Burgermeister is a dual Irish/Austrian who has written for Nature, the British Medical Journal, and American Prospect. She is the European Correspondent of the Renewable Energy World website. She has written extensively about climate change, biotechnology, and the ecology. In addition to the charges currently under investigation that she filed against Baxter AG and Avir Green Hills Biotechnology in April, she has filed charges against WHO and Baxter among others concerning a case of exploding "swine flu" vials meant for a research lab on a busy IC train in Switzerland. Since 2004, HHS has contracted with manufacturers that currently hold U.S. licenses for flu vaccine as part of the National Strategy for Pandemic Influenza. In May 2009, HHS issued new orders on these contracts to produce a bulk supply of vaccine antigen and adjuvant and to produce pilot (also called investigational) lots of a 2009 H1N1 vaccine. Most will be stored in bulk, and a small amount will be prepared as vaccine for use in clinical studies to evaluate vaccine safety and the dosage required for a protective effect. This research will include studies with adjuvant to determine its safety and the effect it would have on the immune system’s response. If you have a hard time reading their graph, Click Here for a revised, larger print, gray background version. If you are looking for general vaccine related graphs, Click here. Who put this woman in charge of pandemic planning? http://vaclib.org/basic/flu/web-swine/triFoldSnapshot_thumb.jpg 58KB JPEG Tri-Fold Snapshot thumbnail sized. BioShield List of Pandemic Vaccines stockpiled under code-names EU666 and US666.